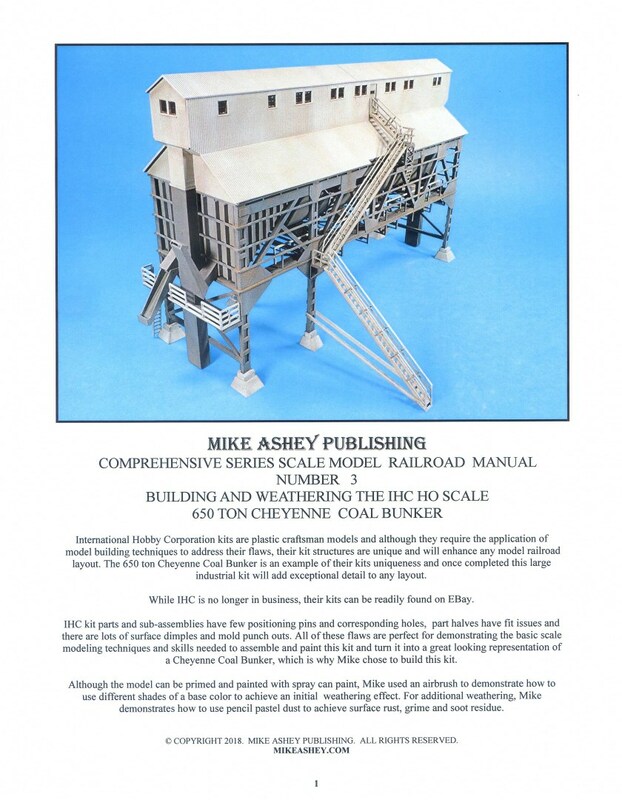 To purchase the IHC 650 Ton Cheyenne Coal Bunker scale model manual on printed paper click this PAYPAL button. To purchase the IHC 650 Ton Cheyenne Coal Bunker scale model manual PDF click this PAYPAL button. This comprehensive series manual shows you how to prepare parts, build, paint and weather this large HO scale industrial structure. International Hobby Corporation kits are plastic craftsman models and they require the application of essential model building skills and techniques to address their flaws. The kit parts and sub-assemblies have few positioning pins and corresponding holes, part halves have fit issues and there are a lot of surface dimples and mold punch outs. All of these flaws are perfect for demonstrating the modeling techniques and skills needed to assemble and paint this kit and turn it into a great looking representation of a Cheyenne Coal Bunker. Although the model can be primed and painted with spray can paint, Mike used an airbrush to demonstrate how to use different shades of a base color to achieve an initial weathering effect. For additional weathering, Mike demonstrates how to use pencil pastel dust to achieve surface rust, grime and soot residue. The manual also provides a listing of the paints, tools and supplies that you will need to build and weather this model.